Kids are the future of the card collecting hobby so it is important to Upper Deck to provide young fans with some great experiences to encourage them to collect. 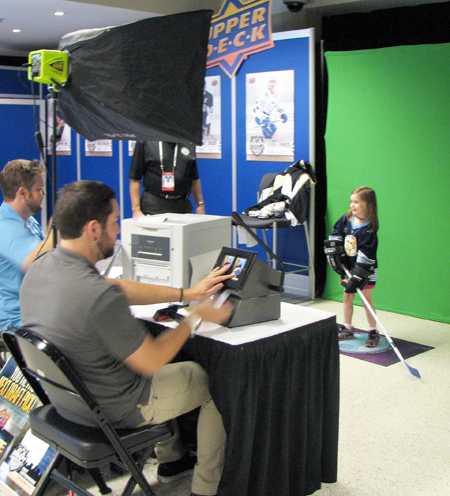 Recently at the 2012 NHL Draft in Pittsburgh, Pennsylvania Upper Deck staff were able to bring a lot of smiles to young collector’s faces with some really engaging programs. 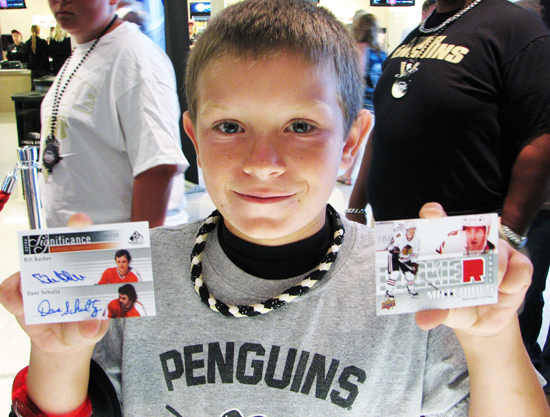 There were plenty of kids on hand at the 2012 NHL Draft and Upper Deck made sure they left feeling excited about collecting NHL cards! 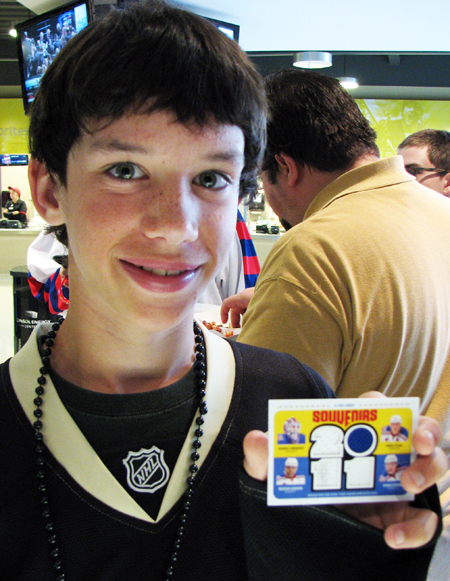 First up there was a wrapper redemption programs where fans could get a special set of UD NHL Draft cards just for opening up three packs of any 2011-12 NHL Upper Deck product at the company’s booth. With such a low cost for entry, Upper Deck staff saw tons of kids coming by to score this great set and with that, hopefully a few new collectors were born over the weekend. 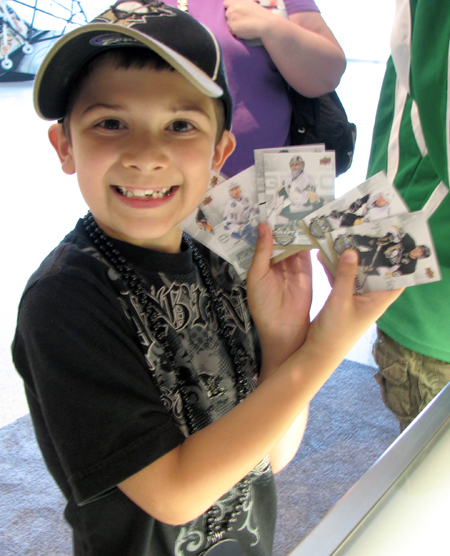 This young collector shows off his six-card Upper Deck NHL Draft set! 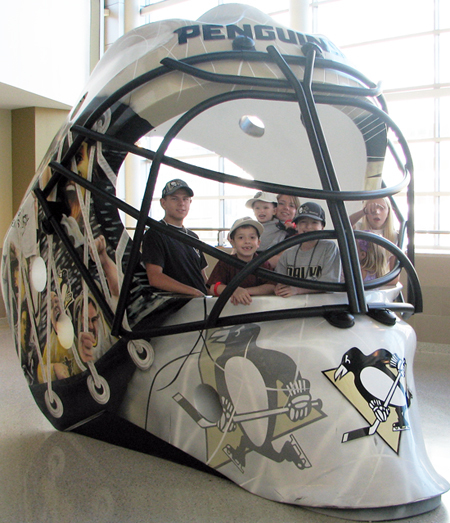 See if you can guess who this young man's favorite Penguins player is! 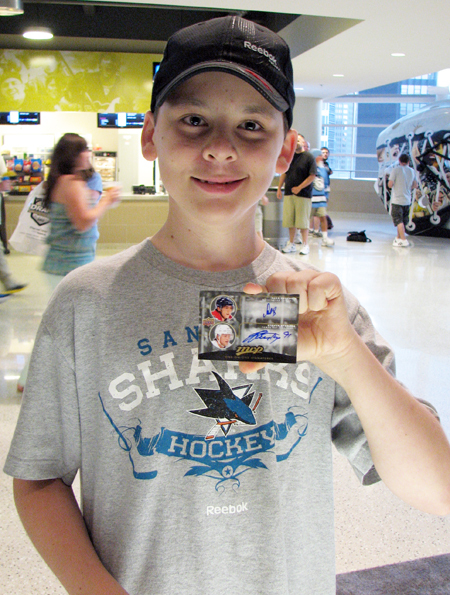 It wasn’t just the limited NHL Draft sets that had these younger collectors smiling. Many pulled some pretty awesome cards from these new Upper Deck packs! We encouraged them to show them off, although we have to be honest, they didn’t need a lot of encouragement. Most were beyond thrilled at pulling these special insert cards! What a pull! A dual signed autograph card of Alex Ovechkin and Steven Stamkos, wow!!! 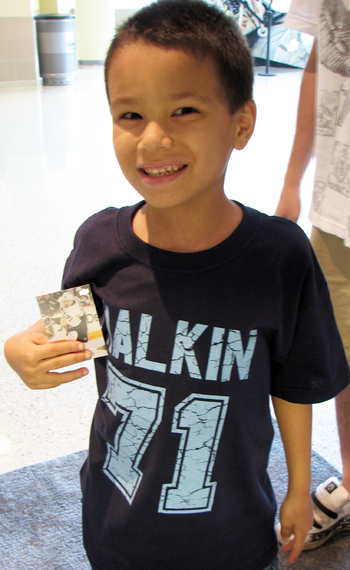 This young man had two great pulls with a dual autograph card and a game-used jersey card, nice! Score! He pulled a quad jersey card featuring four game-used jersey swatches from New York Rangers players! 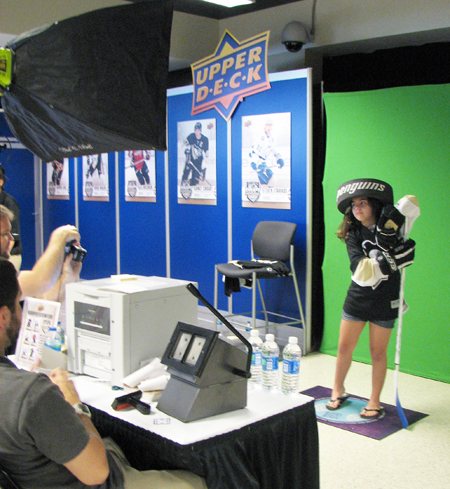 Next, Upper Deck’s Personalized Card Station allowed fans of all ages to get their picture taken by a professional photographer against a green screen while wearing their favorite team uniform. From there we printed a personalized Upper Deck trading card for these fans right there on the spot. This great experience gave hundreds of young fans the opportunity to get their first-ever rookie card! Lights! Camera! Action! 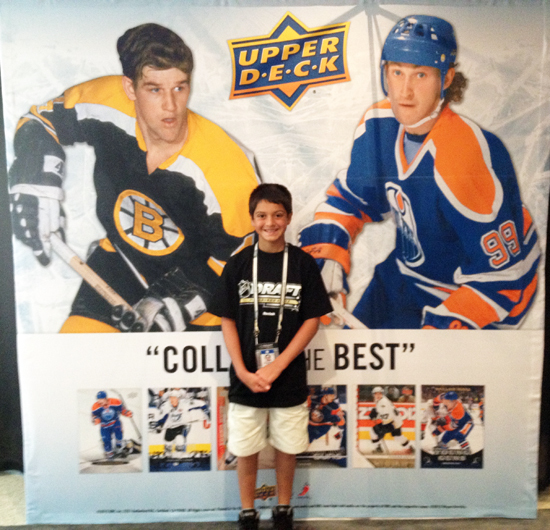 Upper Deck gave young collectors at the 2012 NHL Draft the opportunity to get their very own personalized trading card! Strike the pose and show those pearly whites! Ladies and gentlemen, we have a rookie! Kids loved these memorable keepsakes from the Draft! And then we had one kid who really scored named Sal Cerilli who served as Upper Deck’s NHL Draft Runner. Sal was selected from a send-in essay he wrote and we understand he had the time of his life working with the Tampa Bay Lightning for the two days of the 2012 NHL Draft. Look for more details on Sal’s experience coming up this week! 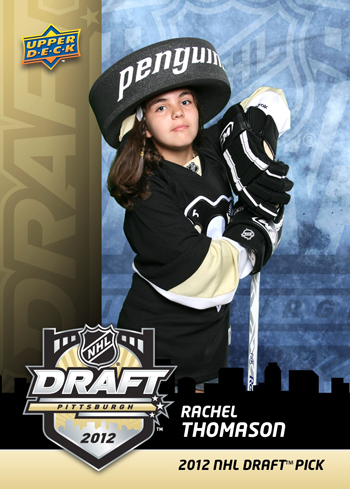 Find out how Sal did at the 2012 NHL Draft later this week! And thanks to all the kids who came out to the show, it was great to get to share this wonderful hobby with you!